There is a movement underway to better maintain new buildings sprouting up across America through the integration of systems that support environmental initiatives. Security products have a higher responsibility than just added safety. They should also strive to improve the quality of the environment within the facility they are protecting. Increased spending on new construction is driving gains in the demand for electronic security products. Designed for high quality and long life, these buildings are being constructed efficiently and incorporate environmental sustainability. It is important that security aims to ensure systems are similarly put together in accordance with the best-practice principles being used in new building design. The shift toward “green” thinking and an increased interest in energy savings, space efficiency, and waste reduction has put sustainable building design at the forefront of industrial and commercial construction projects. Often installed during initial construction, demands are being made for the functionality of electronic security devices to reduce environmental impact and assist with lowering the costs of running a building over its lifetime. Including components for effective, sustainable design requires creating a more holistic perspective of the environment. It means security systems that are capable of interoperating with various other systems, such as building automation. The concept of environmental sustainability involves conserving and enhancing natural resources, preventing environmental pollution, and bringing about a continual improvement in environmental performance. Networked IP-connected systems provide interoperability between various electronic security systems, including building automation systems. Network electronic technology can help minimize energy consumption and maximize energy efficiency. 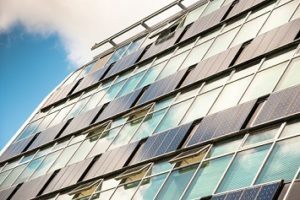 Digital video components incorporate video analytics, and when integrated with web-based building automation, data can be used to reduce energy usage. A video surveillance system can be integrated with HVAC and electrical systems so that when it senses that one area of a building is not in use, it can shut down the systems to reduce energy and lighting costs. When that area is being used, it can turn those systems back on. Combined with building automation, they can manage the amount of air conditioning being sent into separate rooms based on size and need. They are able to monitor real-time gas and electric usage throughout the building. In addition to interoperability, IP-networked systems provide the ability to use mobile and other off-site monitoring and cloud-based storage. Understanding a building’s performance is vital. In the United States, utility experts estimate that lighting consumes 22% of electricity and represents $40 billion a year in energy costs. Newer technologies, sensors, and controls can help reduce lighting consumption. Providing routine maintenance to keep all systems operating at peak performance is another way to conserve energy. Using energy-efficient computers, electronics, and other equipment also optimizes energy performance and increases savings. By promoting a thorough analysis in concert with sustainable design, security in industrial and commercial construction projects can achieve a successful balance between effective risk reduction and enhanced environmental surroundings.